Is it fair to judge a film against 5 previous productions of the film? Or a TV version? Or the classic book it is based on? This review is based solely on the 2015 movie production of “Far From The Madding Crowd”. Carey Mulligan plays Bathsheba Everdene, a young lady in 1874 who is an independent thinker, even before she becomes independently wealthy with the death of her aunt inheriting a rich farm, being pursued by three men. The first man in her life, Matthias Schoenaerts, who proposes marriage and she turns down, is Gabriel, a virile looking acting man who owns a farm which he soon loses and goes to work for Bathsheba. In spite of her turning him down he remains loyal to her always ready to help when she needs help. Her second proposal comes from William, played by Michael Sheen, a wealthy farmer, an older man who offers her security while the third, Tom Sturridge, playing ‘bad boy’ Army man Troy , on the rebound from losing a woman he loves, Juno Temple, playing Fanny Robin, who went to the wrong church on the day of her marriage leaving the soldier high and dry. The film reaches for an epic feeling, but falls short, with the musical score sometimes overpowering a scene and at other times the photography of the beauty of Dorset, England, make it hard to listen to the dialogue of the screenplay’s David Nicholls, based on the Thomas Hardy novel. Where the director, Thomas Vinterberg, and Nicholls, fails the fine performances by the actors is not giving them enough explanation and depth for events that take place. One disturbing aspect is the make-up department’s failing at certain points. For example when the beauty of Bathsheba is talked about and there is a close up of her face she obviously has a ‘growth’, maybe a pimple, on the top part of her nose that comes and goes from scene to scene and is obvious enough to be talked noticed. 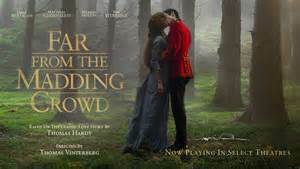 “Far From The Madding Crowd” has some good acting, gives a feeling of the place and time that the story takes place, certainly captures the beauty of the country side, but just stops short of getting the filmgoer pulled into the story.